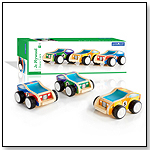 TDmonthly® - New Toys and Games: Jr Plywood Race Cars from GUIDECRAFT INC.
Other products from GUIDECRAFT INC.
Get the fun rolling with our hand-held, Jr. Plywood Vehicle sets! The Race Cars set includes an indigo and green #9 car, a red and blue #7 car, and a yellow and orange #5 car. Features sturdy plywood construction and frosted acrylic windows. Wide, soft plastic treads provide great traction. Detailed artwork enhances each unique vehicle. Individual vehicles are approximately 3.75"W x 2.5"H x 5"D.